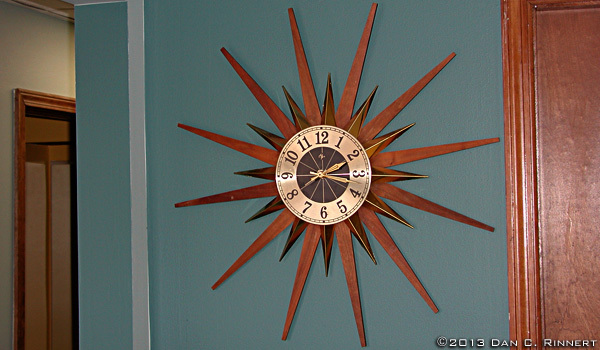 You saw this Elgin starburst clock in my old office. Now, as of today (er, technically, yesterday), the new office is finally painted (except for some touch-up work and also a hallway out back), so it’s time to put the clock up (again–it was up before the wall was painted) in its new home. Didn’t do a yellow background for it, as was the someday plan when I posted about it four years ago in “Retro Week: Elgin Starburst Clock.” The green is the office color and it looks nice. I like the clock and the paint scheme. It has the retro look I was going for. Nice color selection Dan – looks really nice. The clock is one I purchased a few years back. Sat in the basement for a while until I put it up in the old office four years ago. This is a clock. I win.